All right. So let’s take a look at a video I recorded in July. This was after a few weeks off and just getting back into the season. Now one of the things that I’ve always done is come up too high in the extension phase of the stroke. If we look at this position here, you can see how high the hand rides throughout a majority of the extension phase, so we’re looking at this position here. The hand often just stays too high. Same with the left hand. You can see that position there, the hand is up a lot, caused me to put the brakes on a little bit and just creates this extra drag that I don’t need. That was a big focus of mine over the last couple of months. Working on that specifically, to me, it’s probably made the biggest difference in the stroke. Now the other thing that I have a tendency of doing and I saw this in the previous filming that I did, was there’s too much bend in the wrist. You can see here that the wrist is bent a long way from the forearm. The goal is try and keep that as one paddle. The term I like for that is keep a firm and elevated wrist. What that looks like if we bring it back a touch here, is this sort of position here where the hand is slightly down from the forearm, giving you this whole paddle that you can work with. That’s the sort of connection that we want. Partly because of the height of the hand and the way I was pulling through, I was getting too much of a bend through the wrist. The majority of the service area and direction of the pull is coming from just the hand, not the forearm and the hand. It did connect here, so this is a much better position, but through that first almost half of the catch, I was missing a good part of it. That’s something that I also worked on, mostly just by going a little bit deeper through the first phase of the catch. Those are the two biggest things. The other one was you’ll see here, particularly on the breathing strokes, I have this tendency to probably just drive my shoulder down a little bit too deep as I’m in the rotation and if we look back at the start of the video, you’ll see that I’m doing that quite a bit. I just have that tendency to probably throw that shoulder down just a little bit too much and that also causes the arm to sometimes drift out wide and stay a little bit too straight for too long. Cannot see it that well in this video, but that was in July coming off a few weeks out of the water. That was what I looked at. Now the next video here, this is just recently when we were in Thailand, so we have our hell week camps in Thailand. We were doing a 400 turn to time trial and this is in the 400. For the 200 long course, I went 2:15, for the 200 there, so that’s around a 1:07, 1:08 pace. Here you can see here, being able to make those changes pretty well, but some of the things still need a bit of adjustment. The depth of the hands are starting to get there. You can see the entry point is good. The fingers are coming through. Get down to this depth a lot quicker. When you slide your hand forwards, the fingertips should be just deeper than the shoulder, so you can see I get down there a lot sooner and I’m not really riding with the hand up so high. Can still definitely come down a little bit deeper earlier, but it’s quite a bit better. The left hand still has that tendency to be up a little bit too high here, so I’ve really got to emphasize how deep this feels here. So when I’m in the right position, it actually feels like I’m down here, but it actually puts me in that position there. It’s one of those things that really just need to exaggerate when you change it. So if you do the same thing, if you ride too high with that hand, aim really, really deep. It’s often a good way to go. The other thing you’ll see here is the connection through the wrist starting to get there. There’s not as much bend through the wrist here. I’m starting to get that firm and elevated wrist position and here as well, yeah, much better. Not on all the strokes, but on the majority of em, so to me that sort of changed itself just by going that little bit deeper through the extension phase of the stroke. Now the one thing that I’ve really probably need to work on now to bring it down to hopefully a 1:04, 1:05 pace, where I’d like to be for it, is a big opportunity is with this right hand. As I’m taking the breath here, see how straight this arm is? It’s straight, straight, straight. Then it gets into a good catch position once it comes under the shoulder, so in this sort of power phase of the stroke, it’s in a much better position, but that first phase of the catch as I’m getting the breath, the hand or the arm, I’m sorry, is a bit too straight and it sort of pushes down a little bit on the water through here. That’s something that I need to work on from there. I’m doing a drill called single arm scoop which you can watch a video of right now. You can see in that single arm scoop drill, that’s a great one to work on just that aspect of the stroke there, not going down too straight through that first phase of the catch. It’s fine when I’m going at a slower speed, but at that faster pace, I’m just sort of struggling with it at the moment, but working on that for the last couple of weeks, starting to get there. Another thing you’ll see is I have the tendency with my right arm to push back a little bit too far, so what that sort of looks like is the hand will press back and it will get a little bit stuck out the back here. I’m almost at full extension. I’ll show you a view from the top just to sort of show you that. I have this tendency to push back too far with the arm where I’m completely straight with the arm. I’ll show you the top view here. You can get a bit of a sense of it. Here I was working on finishing shorter, so if you play this in slow motion, you can see this view here. All right. You can see the arm’s fully extended. There’s no bend in the elbow which means I just get a little bit stuck out the back which causes me to get thrown off a little bit through that first phase of the recovery. That’s just another thing that I’ve had to work on using the tricep extension drill which you can see right here. That’s a great drill to help with the exit of the hand and again it’s something that I’ll need to make it feel like I’m finishing really short just to be able to make that change. In this video, this was doing a lot of 20 50s. This was on the last one. I went 29, 30 seconds on this last one and the rating’s up around 90 to 95 strokes per minute, but when I’m swimming at that more sort of 1500 pace, which is around a 1:10 pace, the stroke rate’s typically around 80 to 85 strokes per minute which you can see here. I’ve found having a more open recovery has been really beneficial. I used to go for a very sort of high elbow recovery really close to the water, but especially for open water, it’s so much easier, at least for me, to just kind of get that hand coming over a little wider and higher and just doing it that way cause it gets the rating up. 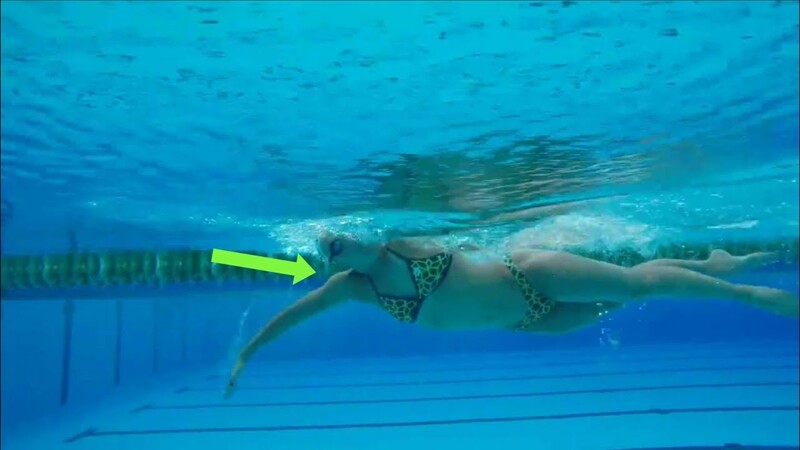 That’s one thing that I’ve found to help a lot with triathletes and open water swimmers is not trying to come too close to the body. Just swing that hand over top, get it entering with some speed, some assertiveness, and it’s a good thing to aim for. If you’re wanting to break through a plateau in your own swimming and you’d like some help with that, then I work with swimmers every day through our online coach membership. This is where people will send me videos every month or so. They’ll take videos from either above or below the water and we’ll have a look at what are some of these things, just like we’ve looked at, that we can identify and work on for a number of weeks. Change that habit, change that motor pattern, and then move on to the next thing. We’re really seeing some good results. 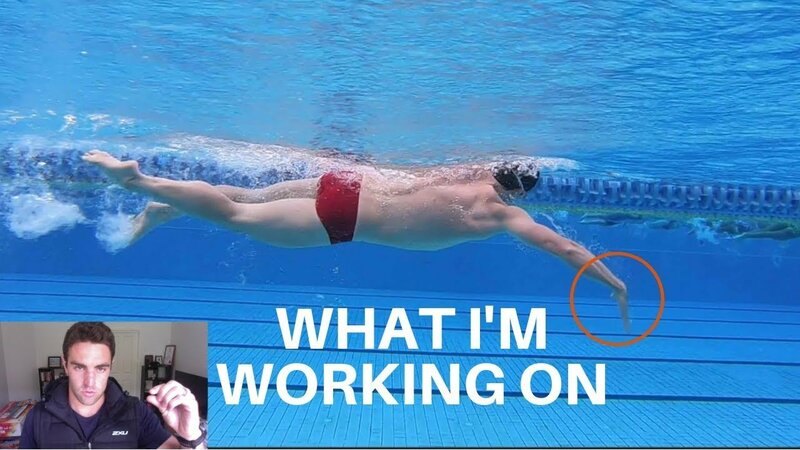 We get these incremental improvements with a lot of swimmers. For example, there’s a swimmer, Martin, who sent in a video just recently and he’s been working with me for the last couple of months. We’ve seen his times have come down around 20 seconds per 100 over the last eight to nine months. It’s really just going through this little changes every month or so, making the change in the habit and the movement pattern. Then that’s when you see the times improve, as opposed to thinking of ten different things, trying to change em all at once. It’s too hard. That’s why I think it’s important to just really keep it simple. One or two things at a time. Get someone who knows what they’re doing to look at your stroke and that way you’ve got more of an idea of what’s actually going to make the difference because we could look at a hundred different things in your stroke. The reality is, very few of those will actually make a big difference. That’s what I see my role as being. 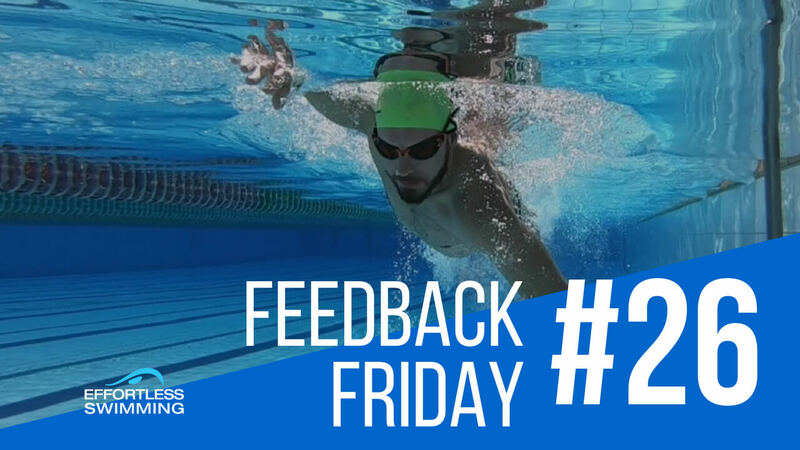 Looking at your video, looking at your stroke and seeing what we can do to bring that time down, bring the speed up, and make things easier. Which Breathing Pattern Is Best?